Hello dear readers, we are conducting a reader survey to find out who our readers are and to get your suggestions and feedback. 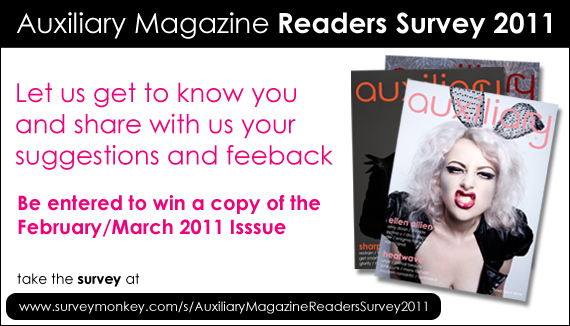 Please take a few minutes to fill out the Auxiliary Magazine Readers Survey 2011 and pass this information on to your friends that read Auxiliary. Help us improve Auxiliary Magazine in 2011! The information gathered from this survey will remain anonymous and will only be used by Auxiliary Magazine. Those who fill out the survey before February 15th will be entered to win a print copy of the upcoming February/March 2011 Issue! You can take the survey at www.surveymonkey.com/s/AuxiliaryMagazineReadersSurvey2011. To be entered to win, you must enter your email at the end of the Auxiliary Magazine Readers Survey 2011. 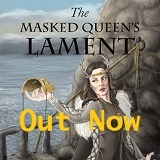 Your email will only be used to contact you if you are the winner and will not be used for any other reason. The winner will be chosen at random from the emails entered at the end of the Auxiliary Magazine Readers Survey 2011 from January 5, 2011 to February 15, 2011. Emails that have been entered multiple times will be disqualified from winning. The winner will be contacted by email after February 15, 2011. Giveaway is for one print copy of the February/March 2011 Issue. The print issue will be delivered by mail with postage covered by Auxiliary Magazine 2-3 weeks after drawing.